A guest room at Henry Howard Hotel. Photo by Kathleen Fitzgerald. New Orleans has been busy preparing a treat for us: Four new boutique hotels are opening this spring. NEW ORLEANS – The latest quartet to hit New Orleans won't be joining its famous jazz scene. The spunky southern city has more character and charisma than most, along with an abundance of top-notch chefs, artists, and musicians. So one would expect an equally impressive roster of hotels. But with the exception of our Gentedimontagna Favorites, visitors have mostly been relegated to big box hotels that don't feel very special. But that is changing. 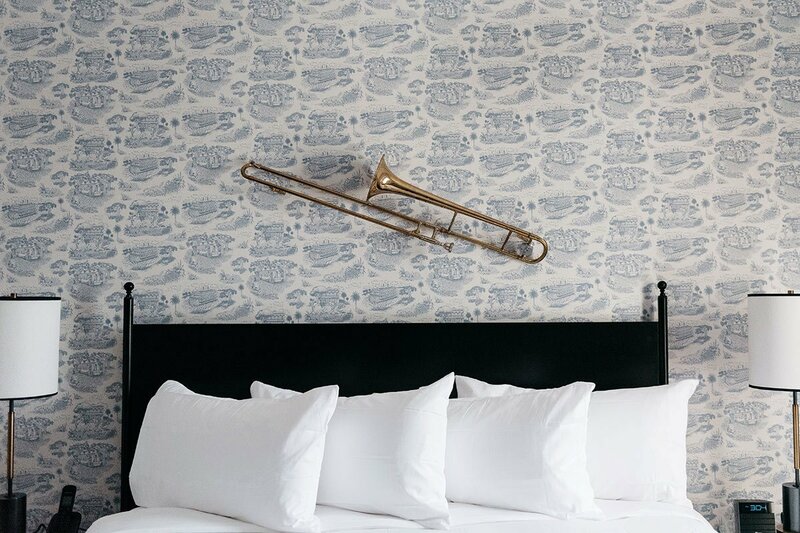 As of this spring, a handful of charming boutique hotels with thoughtful touches like wallpaper inspired by the city and a new spin on the traditional po' boy sandwich have opened their doors for business. The parlor at Henry Howard Hotel. Photo by Alison Gootee. Atmosphere: Old-world elegance merges with Southern hospitality and contemporary design at the eighteen-bedroom boutique hotel. The historic townhouse-style mansion is located in one of the city's most tranquil neighborhoods, just around the corner from the indie shops and restaurants on Magazine Street. Rooms are decorated with a mix of vintage and custom furniture, second-line instruments, and a New Orleans-inspired toile wallpaper featuring local landmarks and characters, like Henry Howard, the hotel's namesake architect. Perks: Start your evening in the twelve-foot ceiling parlor with a Lemon-H, a refreshing homemade lemonade spiked with bourbon and made to order from Friday through Sunday. A guest room at Catahoula Hotel. Photo courtesy of Catahoula Hotel. 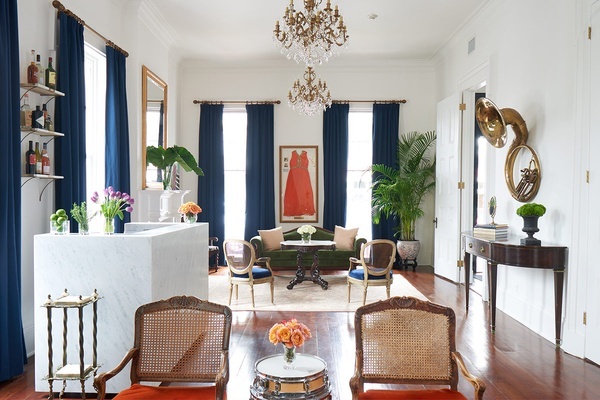 Atmosphere: Nestled on a quiet side street in the city's most centrally located neighborhood, the 35-room restored Creole townhouse has been transformed into a modern escape without detracting from its original patina. Hotel rooms are simple but sleek, with white linens, modern wood furniture, and a few intricate details like hand-woven rattan chairs and soothing rainfall showerheads. There are plans to turn the rooftop deck into a bar, but for now, you can enjoy views of the neighboring skyscrapers and landscape designs by Urban Roots. Perks: The cafe and bar are open from 7 a.m.-12 p.m. and serve a Peruvian-inspired menu, including pisco cocktails and a South American-inspired po' boy made with local smoked pork, avocado, sweet peppers, red onion, and salsa verde. The lobby at Ace Hotel New Orleans. Photo by Fran Parente. Atmosphere: The indie hotel brand's newest outpost sits on the border of one of the city's most interesting emerging neighborhoods. Rough around the edges, with unfinished streets and abandoned buildings, the Warehouse District also has several small pockets filled with inventive restaurants, fine art galleries, and charming small-batch shops. Long time Ace collaborators Roman and Williams designed the 234-room hotel with New Orleans' romantic history in mind, using a dark and moody palette and bespoke furnishings that complement the humble French Deco building. A guest room at The Pontchartrain Hotel. Photo courtesy of The Pontchartrain Hotel. 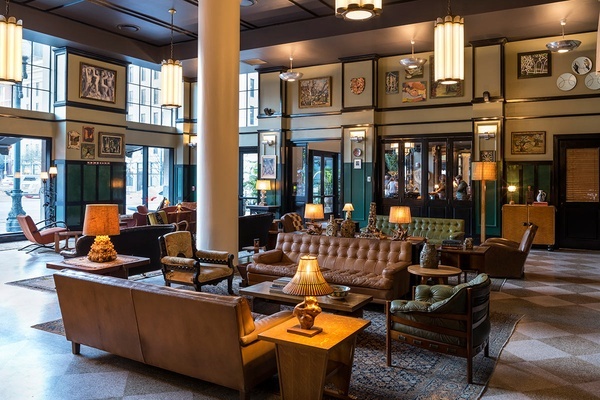 Atmosphere: The storied hotel, known for hosting distinguished guests like Frank Sinatra, Rita Hayworth, and Tennessee Williams (who lived there while writing A Streetcar Named Desire), has undergone a $10-million-dollar renovation and is set to reopen this June. 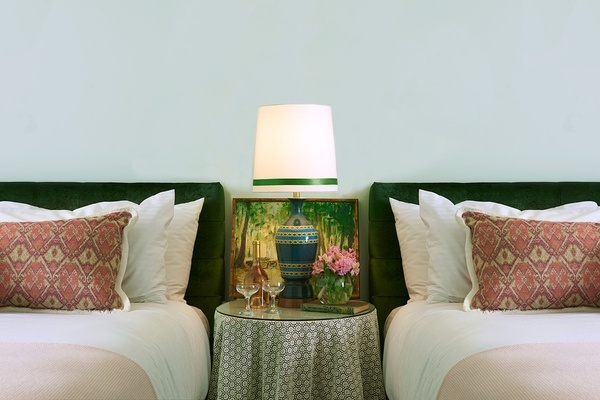 Inspired by classic Garden District homes, guest rooms are painted mint green to mimic the Spanish moss-laden oak trees of the South and have homey details like flowered fabrics and layered Moroccan rugs. Perks: In a nod to Williams' stay, a new rooftop bar and lounge with 270-degree views of the Mississippi River and downtown New Orleans will have the look and feel of a 1940s artist's loft. Shareable plates and snacks are prepared by famed New Orleans' chef John Besh.